(Phys.org) —Herds of wooly mammoths once shook the earth beneath their feet, sending humans scurrying across the landscape of prehistoric Ohio. But then something much larger shook the Earth itself, and at that point these mega mammals' days were numbered. Something – global-scale combustion caused by a comet scraping our planet's atmosphere or a meteorite slamming into its surface – scorched the air, melted bedrock and altered the course of Earth's history. Exactly what it was is unclear, but this event jump-started what Kenneth Tankersley, an assistant professor of anthropology and geology at the University of Cincinnati, calls the last gasp of the last ice age. "Imagine living in a time when you look outside and there are elephants walking around in Cincinnati," Tankersley says. "But by the time you're at the end of your years, there are no more elephants. It happens within your lifetime." Tankersley explains what he and a team of international researchers found may have caused this catastrophic event in Earth's history in their research, "Evidence for Deposition of 10 Million Tonnes of Impact Spherules Across Four Continents 12,800 Years Ago," which was published in the Proceedings of the National Academy of Sciences. The prestigious journal was established in 1914 and publishes innovative research reports from a broad range of scientific disciplines. Tankersley's research also was included in the History Channel series "The Universe: When Space Changed History" and will be featured in an upcoming film for The Weather Channel. This research might indicate that it wasn't the cosmic collision that extinguished the mammoths and other species, Tankersley says, but the drastic change to their environment. "The climate changed rapidly and profoundly. And coinciding with this very rapid global climate change was mass extinctions." Tankersley is an archaeological geologist. He uses geological techniques, in the field and laboratory, to solve archaeological questions. He's found a treasure trove of answers to some of those questions in Sheriden Cave in Wyandot County, Ohio. It's in that spot, 100 feet below the surface, where Tankersley has been studying geological layers that date to the Younger Dryas time period, about 13,000 years ago. About 12,000 years before the Younger Dryas, the Earth was at the Last Glacial Maximum – the peak of the Ice Age. Millennia passed, and the climate began to warm. Then something happened that caused temperatures to suddenly reverse course, bringing about a century's worth of near-glacial climate that marked the start of the geologically brief Younger Dryas. 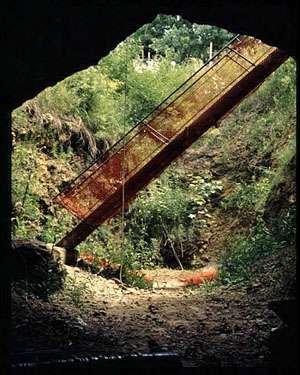 There are only about 20 archaeological sites in the world that date to this time period and only 12 in the United States – including Sheriden Cave. "There aren't many places on the planet where you can actually put your finger on the end of the last ice age, and Sheriden Cave is one of those rare places where you can do that," Tankersley says. In studying this layer, Tankersley found ample evidence to support the theory that something came close enough to Earth to melt rock and produce other interesting geological phenomena. Foremost among the findings were carbon spherules. These tiny bits of carbon are formed when substances are burned at very high temperatures. The spherules exhibit characteristics that indicate their origin, whether that's from burning coal, lightning strikes, forest fires or something more extreme. Tankersley says the ones in his study could only have been formed from the combustion of rock. 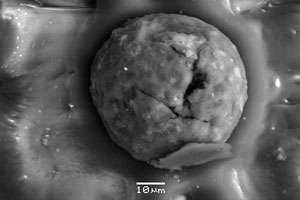 The spherules also were found at 17 other sites across four continents – an estimated 10 million metric tons' worth – further supporting the idea that whatever changed Earth did so on a massive scale. It's unlikely that a wildfire or thunderstorm would leave a geological calling card that immense – covering about 50 million square kilometers. "We know something came close enough to Earth and it was hot enough that it melted rock – that's what these carbon spherules are. In order to create this type of evidence that we see around the world, it was big," Tankersley says, contrasting the effects of an event so massive with the 1883 volcanic explosion on Krakatoa in Indonesia. "When Krakatoa blew its stack, Cincinnati had no summer. Imagine winter all year-round. That's just one little volcano blowing its top." Micrometeorites: smaller pieces of meteorites or particles of cosmic dust that have made contact with the Earth's surface. Nanodiamonds: microscopic diamonds formed when a carbon source is subjected to an extreme impact, often found in meteorite craters. Lonsdaleite: a rare type of diamond, also called a hexagonal diamond, only found in non-terrestrial areas such as meteorite craters. Tankersley says while the cosmic strike had an immediate and deadly effect, the long-term side effects were far more devastating – similar to Krakatoa's aftermath but many times worse – making it unique in modern human history. In the cataclysm's wake, toxic gas poisoned the air and clouded the sky, causing temperatures to plummet. The roiling climate challenged the existence of plant and animal populations, and it produced what Tankersley has classified as "winners" and "losers" of the Younger Dryas. He says inhabitants of this time period had three choices: relocate to another environment where they could make a similar living; downsize or adjust their way of living to fit the current surroundings; or swiftly go extinct. "Winners" chose one of the first two options while "losers," such as the wooly mammoth, took the last. "Whatever this was, it did not cause the extinctions," Tankersley says. "Rather, this likely caused climate change. And climate change forced this scenario: You can move, downsize or you can go extinct." Humans at the time were just as resourceful and intelligent as we are today. If you transported a teenager from 13,000 years ago into the 21st century and gave her jeans, a T-shirt and a Facebook account, she'd blend right in on any college campus. Back in the Younger Dryas, with mammoth off the dinner table, humans were forced to adapt – which they did to great success. 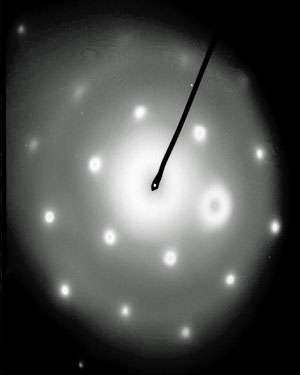 An image of the X-ray diffraction pattern of lonsdaleite, or hexagonal diamond, from Sheriden Cave. That lesson in survivability is one that Tankersley applies to humankind today. "Whether we want to admit it or not, we're living right now in a period of very rapid and profound global climate change. We're also living in a time of mass extinction," Tankersley says. "So I would argue that a lot of the lessons for surviving climate change are actually in the past." He says it's important to consider a sustainable livelihood. Humans of the Younger Dryas were hunter-gatherers. When catastrophe struck, these humans found news ways and new places to hunt game and gather wild plants. Evidence found in Sheriden Cave shows that most of the plants and animals living there also endured. Of the 70 species known to have lived there before the Younger Dryas, 68 were found there afterward. The two that didn't make it were the giant beaver and the flat-headed peccary, a sharp-toothed pig the size of a black bear. Tankersley also cautions that the possibility of another massive cosmic event should not be ignored. Like earthquakes, tsunamis and volcanoes, these types of natural disasters do happen, and as history has shown, it can be to devastating effect. "One additional catastrophic change that we often fail to think about – and it's beyond our control – is something from outer space," Tankersley says. "It's a reminder of how fragile we are. Imagine an explosion that happened today that went across four continents. The human species would go on. But it would be different. It would be a game changer." Tankersley is a member of UC's Quaternary and Anthropocene Research Group (QARG), an interdisciplinary conglomeration of researchers dedicated to undergraduate, graduate and professional education, experience-based learning and research in Quaternary science and study of the Anthropocene. He's proud to be working with his students on projects that, when he was in their shoes, were considered science fiction. Collaborative efforts such as QARG help break down long-held barriers between disciplines and further position UC as one of the nation's top public research universities. "What's exciting about UC and why our university is producing so much, is we have scientists who are working together and it's this area of overlap that is so interesting," Tankersley says. "There's a real synergy about innovative, transformative, transdisciplinary science and education here. These are the things that really make people take notice. It causes real change in our world." What sense does it make to revive the possibility of recurring catastrophies within human historical times without embarking upon a thorough re-examination of the catastrophist debates of former decades? If there exists a growing number of researchers who are coming to this conclusion that mankind might have witnessed global catastrophe, then what does that say about the enigmatic similarities in the mythological stories and petroglyphs which mark the start of modern man's intellect? What does the idea of recent catastrophe suggest about genetic analyses which point to a common ancestor? Given that the Garden of Eden archetype actually preceded religion, what does a global catastrophe suggest about that story? Doesn't the Garden of Eden story refer to this hunter-gatherer time prior to farming? Is it not possible that the tree of life archetype and the red apple in some way symbolize the landfall of a red hot cosmic body? Don't we ALSO use analogies when we don't understand? Younger Dryas Extinction Event is not believable. "The neutrality of this article is disputed. Relevant discussion may be found on the talk page. Please do not remove this message until the dispute is resolved. (February 2013)"
Thje neutrality of ALL wike pages concerning climate change, as well as all those about politics, should carry a much stronger disclaimer, especially after the cleansing of all Barack Obama related pages since 2007 and the rewriting and editing of all climate change pages by William Connolley, wiki's editor for climate for many years. Connolley, an AGW fanatic, who has been connected to East Anglia of Climategate fame, was caught editing and rewriting over 5,400 pages even peripherally related to Climate, deleting many others and banning contributors who disagree with him. The resulting scandal forced Wiki to ban him for life, otherwise he'd still be there, imbuing the "people's encyclopedia" with propaganda. Wikipedia is an ENCYCLOPEDIA, and encyclopedias are only useful for identifying consensus views in science. It's really quite peculiar that this is not apparent to everybody by now. How can we have a rational discussion of science within the presence of superusers who can singlehandedly decide the fate of the arguments? Hannes - Okay, let's take your definition of an encyclopedia as law. In that case NO controversial issue should ever be included in an encyclopedia until all the controversy ends. Right? Bull. People have a right to know about those subjects also. And for those interested, both sides' positions should be presented. Hannes - You also DO make good points about indigenous peoples' accounts of catastrophes. Those accounts exist around the world. And people are working on those - though not so many in academia (to some extent that is a verboten area). I would recommend Ed Grondine's book, "Man and Impact in the Americas" as a starter (Self published). 450 pages of VERY small print, with lots of footnotes and appendices. It doesn't cover Asia or Europe or Africa, obviously. There will not be an eastern hemisphere sequel. Unfortunately, Grondine had a stroke and is not up to it anymore. "Requiem for the Younger Dryas impact hypothesis? This is the strong conclusion of a new paper in the Earth Science Reviews by Pinter et al (via Scribd)." "This paper is unlikely to the very last word on the subject, but it is likely to be the last time the mainstream paleo-climatologists are going to pay this much heed unless some really big new piece of evidence comes to light." Needless to say, this is not "some really big new piece of evidence". It is also nice to see how Tankersley returns to his crackpot behavior. 2 (!) press releases, an earlier movie about a controversial thesis, and now a new movie. But not any new science, just repeating the old. - Analogies are used heuristically when we don't have equivalences to study. @geokstr: Sure any mass extinction event gives constraints to climate, but recent US politics has no correlation to climate science. The AGW observation predates the current administration and the only change was that it was suppressed in US by the one before that. "Climategate" is a known crackpot theory, like the one crackpot theory we should discuss instead of climate. Connolley was a known climate scientist at the time, so of course he was into that type of editing, any specialist would. "In July 2006, a New Yorker article described him as briefly becoming "a victim of an edit war over the entry on global warming", in which a sceptic repeatedly "watered down" the article's explanation of the greenhouse effect." [ http://en.wikiped...onnolley ] So you are propagating a 4d (!) crackpot theory! Why do you comment on science sites anyway? You are way crackpottier than the sometime crackpot theory ending up here. Adapt or die is the challenge for all life, except for the AGWites who insist upon using state power to prevent change and who do not want to adapt. "A small population survived on St. Paul Island, Alaska, up until 3750 BC, and the small mammoths of Wrangel Island survived until 1650 BC." Islands without human would be safe havens if the humans did the killing. If it was an impact, they would have died out with all the others. Connolley the VICTIM of an edit war??!!!" Connolley was the self-elected god of global warming. Wike let him do anything he wanted. Only Connolley's opinion mattered. There are plenty of climate scientists who disagree with the conclusions of Connolley. They got aced out of power in the IPCC long ago, but their science is still science and their interpretations are far different than the cabrón Connolley's. The science is not settled. One side hijacked the science back in the 1980s, and once they did they got the ear of policymakers. Connolley was their Attack Dog on Wikipedia. Don't let some attacks by Tornbjorn here sway you, folks. Connolley was banned from Wikipedia by his OWN actions. To claim that skeptics had ANY pull within Wikipedia whatsoever is ridiculous. @Parker - "If it was an impact, they would have died out with all the others." Your simplistic assumption is flawed. If some of the humans lived on, then some of the mammoths would have, too. You do not know anything about the conditions then, but are filling in knowledge with your 3rd grade assumptions. If anything, you should be asking how the impact in North America killed the mammoths in Siberia - and why all the mammoth remains found are either up near the shore of the Arctic Ocean or on islands in the Arctic Ocean (and under the sea bottom in between). But it wasn't just mammoth bones found up on those islands. Rhinoceros bones, too. Explain that.